Newham Local Government Branch AGM 2015 - The threat to your pensions- "if it sounds too good to be true then..."
On Friday I was invited to speak at the annual general meeting of the Newham UNISON branch at the Town Hall in East Ham. This was in my trade union capacity as the Chair of the London UNISON pension network. This is my written speech below. 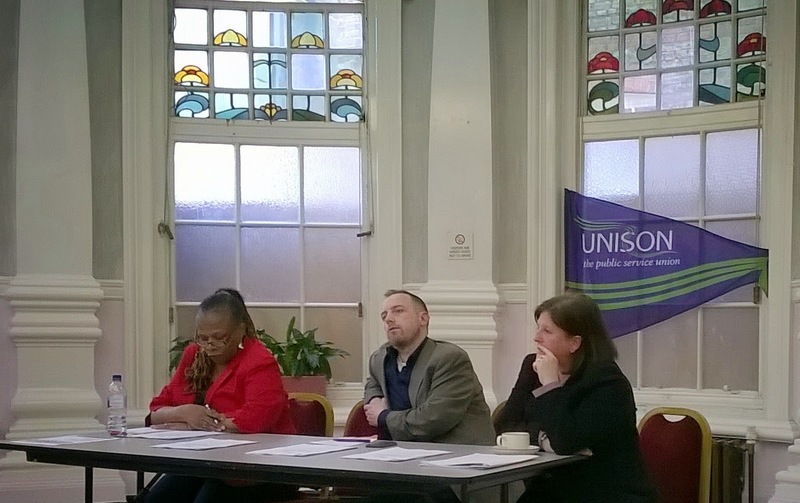 "Thank you Gloria and Newham UNISON for inviting me to speak on this very important issue. Like many of us in the Labour movement I wear a number of different work hats but I am proud to be here today as a Unison rep on my local government pension scheme (LGPS) committee for the past 20 years or so. I was privileged to talk to this AGM some years ago about the many advantages of joining the LGPS. I now want to speak to you today about a possible threat to your pension and that of your families and friends. It is complicated but maybe it is best if I outline what I believe to be the problem and what I think is the solution, then throw it open to the Q&A. Firstly, let us never forget that Pensions are a fundamental trade union issue. In fact one of the founder unions that went to form UNISON was set up specifically to argue for pensions for its members. A former manager of West Ham Council trams was instrumental in setting up that union and the LGPS. In my grown up job as a housing officer in the East End of London, I see first hand the miserable and degrading poverty that so many of our elders live in. Too frightened to put the heating on in winter, surviving on cheap out of date foodstuffs, too poor to buy their grandchildren treats. In many ways, the current pension future facing workers is now even worse. Millions of workers in our sector have no access to any employer pension, since they work part time or are paid too little. Millions more are being cheated by their employer with tiny and inadequate contributions. While complete untruths are said about the sustainability of defined benefit schemes such as Local Government Pension scheme and other public sector schemes. To top it all, this Tory led government, will from next month April 6, allow thieves and con merchants to steal and feast upon our members pensions, in what I have no doubt will be the greatest ever miss-selling scandal. From April 6 this year, this Conservative led government is about to play a huge trick on ordinary working people. People who have skimped and saved over the years to put money by for their futures. This money is being deliberately put at risk and the only ones to benefit will be the City crooks that finance the Conservative Party, as they rob our members over the age of 55 of their money and that of their spouses. 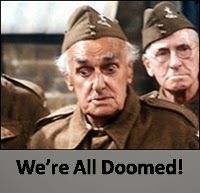 Tory Chancellor, George Osborne, calls April 6 "pension freedom day". Colleagues, this is not freedom, it is an occupation, an occupation by those who see you as easy pickings; an occupation that will destroy lives and end up with many of our members retiring into and dying in poverty. Our members in the Local Government Pension Scheme and other funded Pension schemes will be targeted by armies of thieves, spivs and charlatans, as they did under Thatcher, when millions of people were told to buy personal pensions and sell their company schemes. Those of you here who have pension money invested in stakeholders or auto enrolment schemes will also be targeted by those wanting to steal your futures as well. Even worse, last week during the budget, the Tories announced that pensioners who have already taken out private pensions will also be able to cash them in. At the cost of a tax liability and even more rip off charges. We must as a union save our pensions and save our members from having them stolen from them and exchanged for snake oil. We have a responsibility to make sure that our pensions are safe. As I said before one of the reasons for forming unions was for decent secure retirements and nothing has changed since, so we must do whatever is necessary to defend our members and defend their pensions. Thank you". 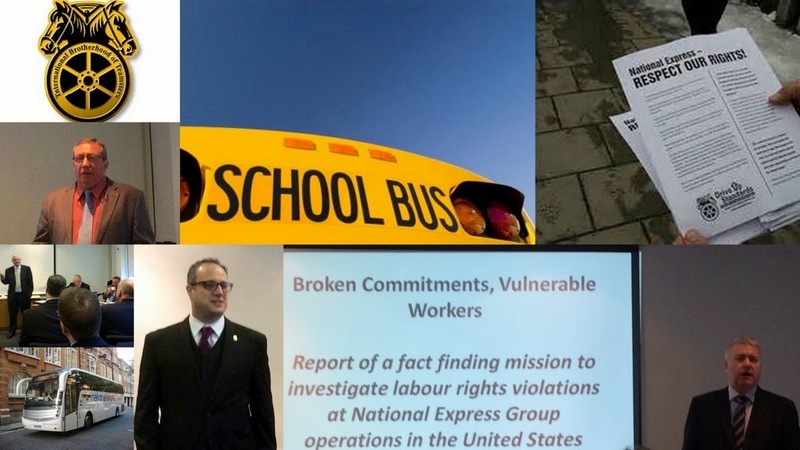 On Tuesday morning I attended another presentation by US transport union, the Teamsters, to pension funds on the anti-union practises by a National Express owned US company called Durham which runs schools buses. The Chair of the Local Authority Pension Fund Forum (LAPFF), Cllr Kieran Quinn, opened the meeting and made it clear that while he has a union background, as an investor he has concerns about the financial prospects of a company, that appears not to treat its workforce properly nor provide a safe environment for school children. He has had a number of meetings in the past with National Express where he has been told that the unions have exaggerated the problem. However, when he has asked for proof of this they have never produced this information. Teamsters spokesperson, Louis Malizia, was even more blunt. The "poisonous" and "unsustainable" anti-worker and unsafe business practises will put the company at risk. He described the union busting and black-listing activities condoned by National Express. How union activists are victimised for reporting safety issues and the company continues to ignore decisions in favour of the union by the US courts. The company is now facing a backlash over civil rights and is losing contracts. The final two speakers were two British Members of Parliament, Ian Lavery, MP, and Jim Sheridan, MP, who had both gone over to the US on a fact finding visit. During this visit they spoke at community meetings, met school bus drivers and were interviewed by US press and television stations. They were also thrown out of a local bus depot run by Durham when they tried to visit. Jim Sheridan, MP, asked why doesn't National Express operate in the same way in the US as in the UK where they have usually good relations with the unions? Why are they treating children's safety differently? Why are they putting profits above safety? This is not some sort of "Communist plot" but about safety. No-one wants "revolution" they want a "resolution". Other bus companies in the US recognise trade unions, run safe services and make money without exploiting people. Ian Lavery, MP, spoke about the unacceptable and unsafe US school bus services that would just not be tolerated in the UK. The bus drivers are poorly paid but do a very responsible job. He is a former Pension trustee and understands the need to make money to pay for pensions but there has to be a social conscience. Ian introduced a report that he and Jim wrote about their visit that they are just about to publish called "Broken Commitments, Vulnerable Workers". In the Q&A I made the point that not exploiting people is not just about having a social conscience it is also a good investment choice. Research shows that long term investors such as pension funds get better returns from investing in companies that have good governance and do not for example treat their workers badly. Also, why doesn't National Express engage with its shareholders such as LAPFF? What else are they hiding? 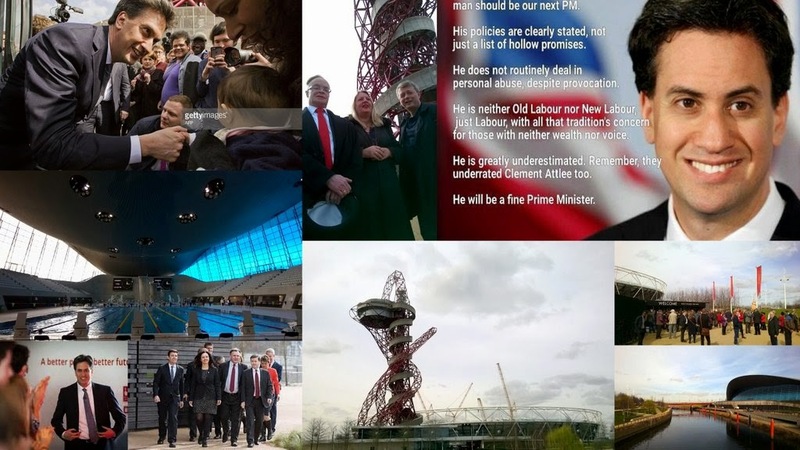 Yesterday morning Labour Leader Ed Miliband launched the Party campaign at the top of the Orbit. Ed is pictured in the collage (top left) shaking the tiny hand of Juniper, baby daughter of Newham Councillor, Farah Nazeer. UNISON Assistant General Secretary, Liz Snapes, was also there. Waiting outside for Ed to appear there was definitely an air of excitement amongst supporters. The 4 tory yobs who dressed up as SNP supporters arrived to late to shove anyone. I hadn't applied for a ticket and so went for a swim in the Aquatic centre next door. After the Stratford By Election candidate selection and West Ham Labour General Committee some of us went to support this fund raiser. It took place in the Royal Regency in Manor Park. 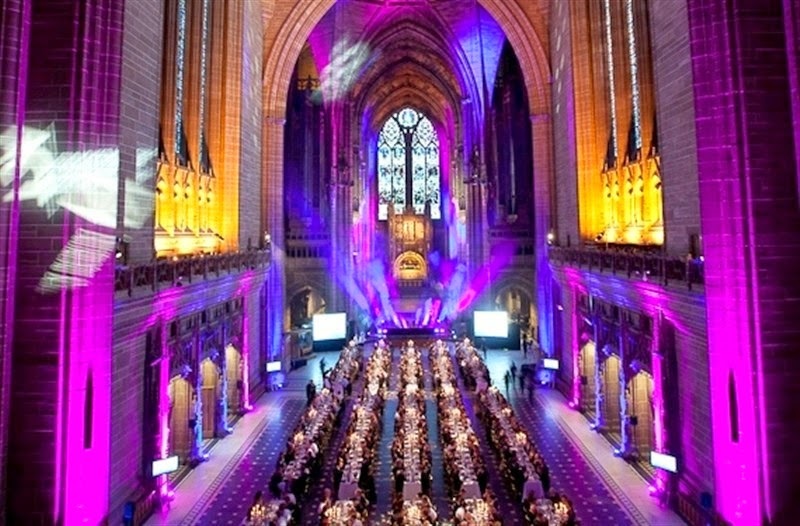 Which is a magnificent former cinema restored as a plush function venue. We missed the speeches but met up with our MP Lyn Brown and East Ham MP Stephen Timms. 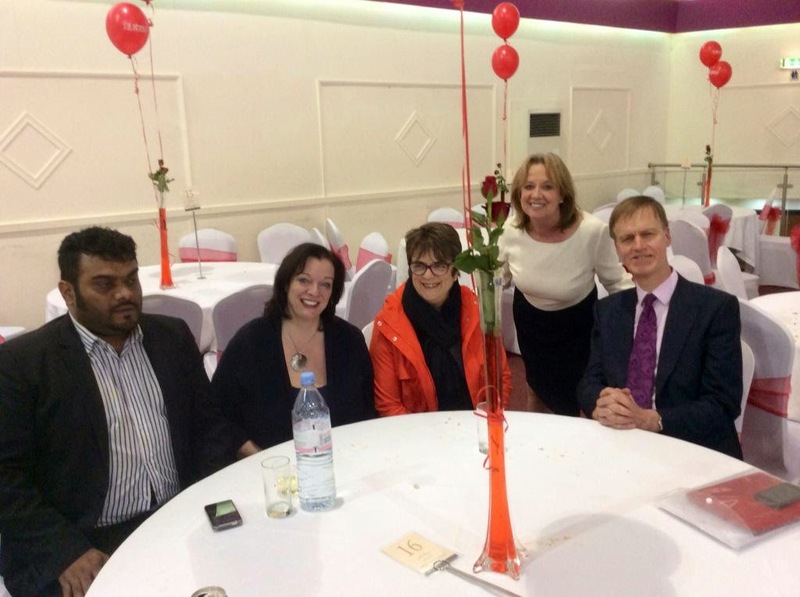 Seen in picture with former MP Sarah Mccarthy_Fry, Redbridge Councillor Shelia Bain and the newly elected West Ham delegate to Labour Party Conference (and PCS activist) Anamul Islam. This is great news. Tonight local new Mum Charlene McLean was selected by Stratford and New town Labour Party ward to be their candidate in the forthcoming by election. This will take place at the same day as the general election. I was the procedural secretary for the meeting and saw the ward unanimously select her. Following the announcement of the decision there was an emotional ovation by members for Charlene. I am not a member of the Local Government Service Group anymore (even though my pay and conditions like many UNISON Community members are still determined by the National Joint Council) so I was not there yesterday and don't know how accurate this UNISON Active post is but it has a ring of truth about it. I may not agree with every comment it makes but would agree that it is far, far better than the self seeking, pompous and nonsensical accounts by the Evil Ones' - Goblin in Chief. 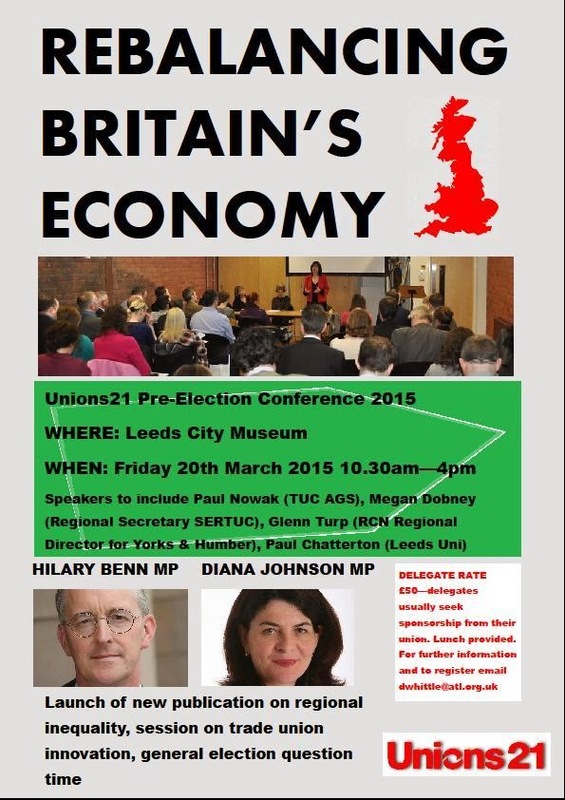 BTW - did the conference total cost the union £250,000 or £750,000? 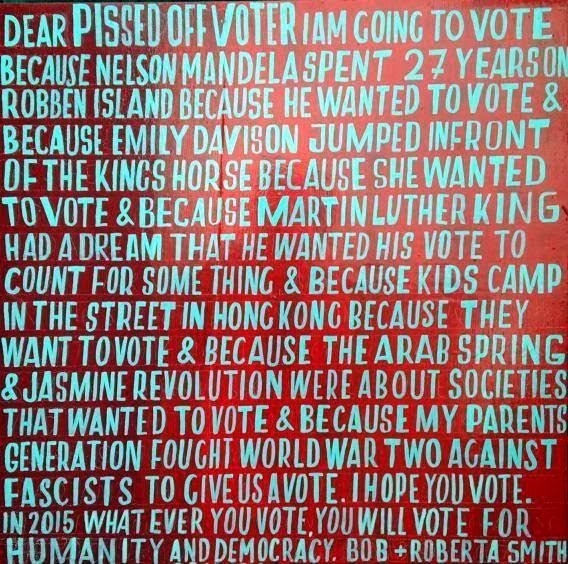 The right to vote is so precious. People have suffered and died for this right. Politics in this country is far from perfect but if you don't vote, then you betraying these democracy martyrs from the past and present and just giving the thumbs up to bigots, dictators and fascists. Hat tip Bill Beedell on Facebook. Great Youtube video produced by the Institute of Employment Rights' featuring Professor Keith Ewing and John Hendy QC. I don't think many trade union members really understand that the most important thing we do is collective bargaining with employers over pay and all other terms and conditions. The case for the reintroduction of sectoral collective bargaining in this country, to not only tackle social justice but increase economic demand, is unanswerable in my view. See motions from my branch sent to Labour Link and National Delegate conference. 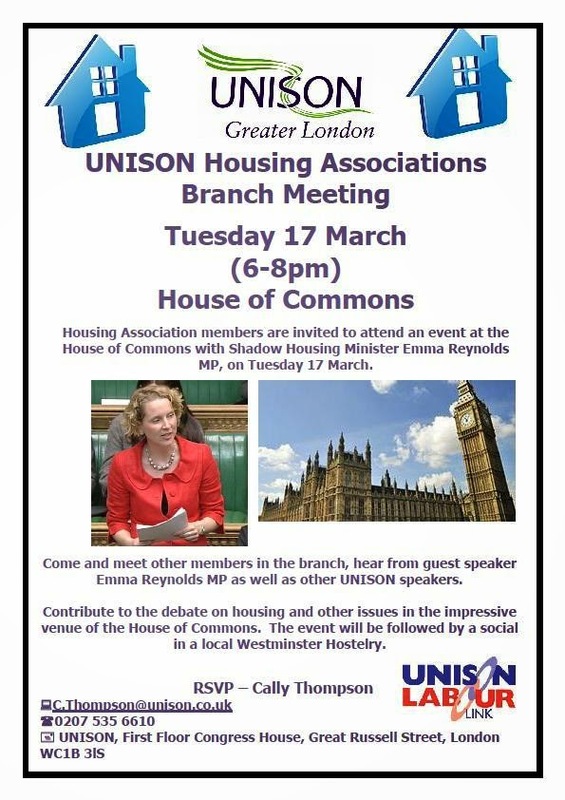 Our keynote speaker was Labour Shadow Housing Minister, Emma Reynolds MP. Shadow Minister for Civic Society, Lisa Nandy MP, had to drop out as a speaker at the last minute. Emma was supposed to only be there for 20 minutes but stayed for about 45 minutes, giving first a speech and then she engaged with us in a prolonged Q&A. We had UNISON members from all over London and as far away as Norfolk, Kent and Surrey. Housing management workers and those working in care and support. There was a really positive and far reaching debate with Emma about the housing policy of a future Labour government. Including difficult questions on the future of right to buy, social rents and rent controls for the private sector. After Emma our UNISON regional officer Colin Inniss gave a rousing speech on how important the General Election will be to our members. We also had a planning discussion on how to mobilise telephone, leafleting and door knocking teams in marginal seats. After the close of the meeting we went off to our social at the Weatherspoon near Trafalgar Square and were able to continue the debate on housing in between helping to also celebrate St Patrick's Day. Great video from Trade Unions for Labour (TULO) on the Labour Party "Manifesto for Change". A quietly spoken, Paul Kenny, from the GMB asks trade unionists to "When it comes to Vote, Vote Labour, no other Party, No other movement is going to deliver that change for you"
This is off message and a little late but last month I went for a weekend in Cromer, Norfolk and went on this fantastic 8.5mile walk on the Saturday starting in Wells. 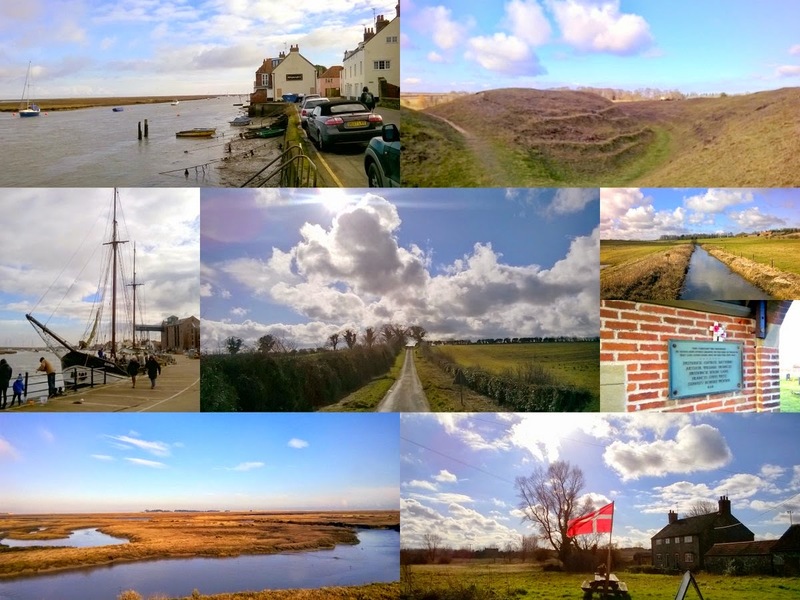 The Norfolk coast and countryside is simply stunning. The blue, big Eastern skies as well as warm-ish weather did help of course. The first part of the walk along the harbour, coastline and then salt marshes was especially beautiful. The iron age Warham camp (top right of collage) was incredibly well preserved considering its age and very atmospheric. It is incredible that you can wonder freely over a huge historic structure that is over 2,000 years old . Had a very pleasant lunch in the Carpenter Arms in Wighton (with Danish host Carsten) and then cross country walk back to Wells. "Union representatives here to stay on trustee boards"
The "Local Government Chronicle" reports huge fights currently going on between trade unions and Council officers about representation on the new Local Government Pension Scheme Boards. It is clear that some Councils are trying to openly sabotage the independence and effectiveness of these Boards. 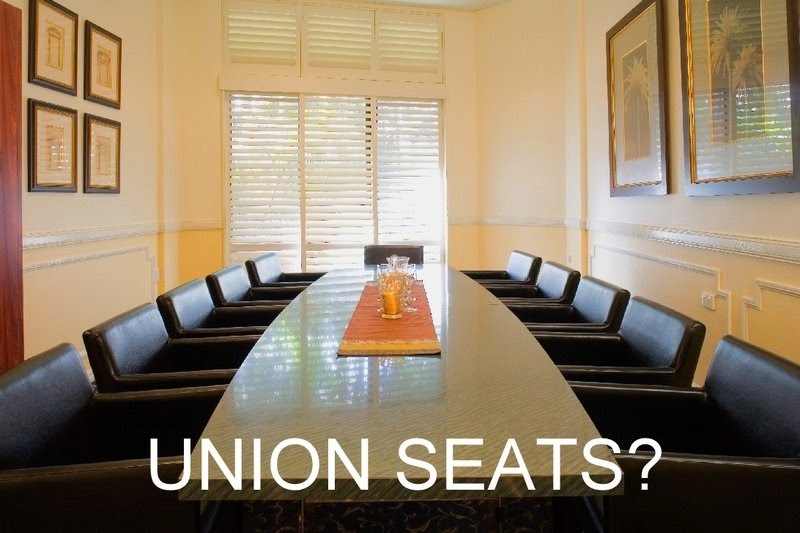 This recent article by Laura MacPhee from "Engaged Investor" show the value of union representatives on Pension Boards generally. Some 4 million people in the UK depend upon the LGPS and it has over £180 billion of assets, so it is imperative to the national economy that it is well run. It is completely disgraceful what is going on and I hope a future Labour Government moves swiftly to sort out the mess created by this Tory Governments failure to take on their paymasters in the financial services industry. I was pleased last week to hear that I had been elected unopposed to this year's UNISON Labour Link National Forum with Jonathan Slater and James Beckles. There is still an election for female delegates to National Forum and Labour Party Conference. Ballot papers have been sent out to all London Branches and have to be returned by 12 Noon this Friday 27 March 2015. 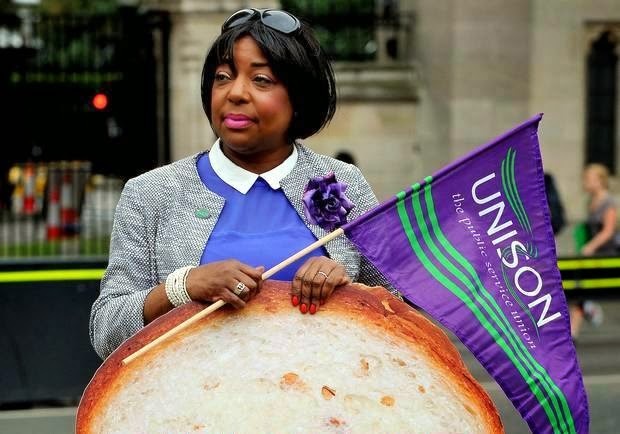 Picture above is of Yvonne Green (featured in the Independent Newspaper) who has also this year been elected (by a massive majority) to be the London UNISON Convenor. "We are all seeking election to represent the views of APF payers in the London Region at the National Labour Link Forum. You want delegates who will be listened to and not be afraid to argue for change within the Labour Party but who also realise that the only alternative to Labour is another dose of Clegg and Cameron. Next year London will also be electing a London Mayor and new Assembly and we need to play our part in this election. 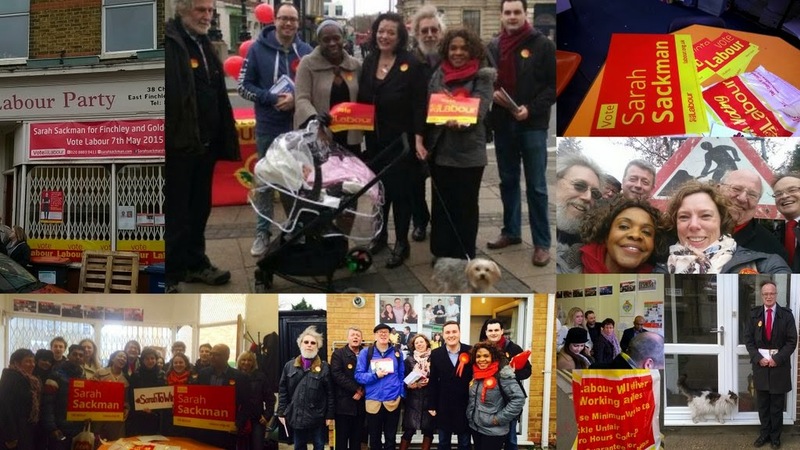 But we now must unite around the Party and work to bring down this ConDem Government on May 7"
West Ham Labour in Forest Gate & "Keeping it Co-op"
This collage is from today's West Ham Labour Party stall in Forest Gate. Lyn Brown MP and local Party members and supporters handed out leaflets on Labour plans to save the NHS and rent controls. We also leafleted shoppers at our local Co-operative store over the forthcoming vote at the Co-op AGM about retaining a political voice for the movement. 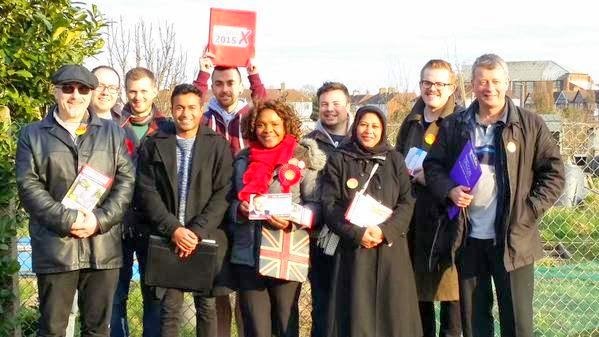 Afterwards Party members went off to campaign in Hainault to support the Labour candidate in Ilford North, Wes Streeting. 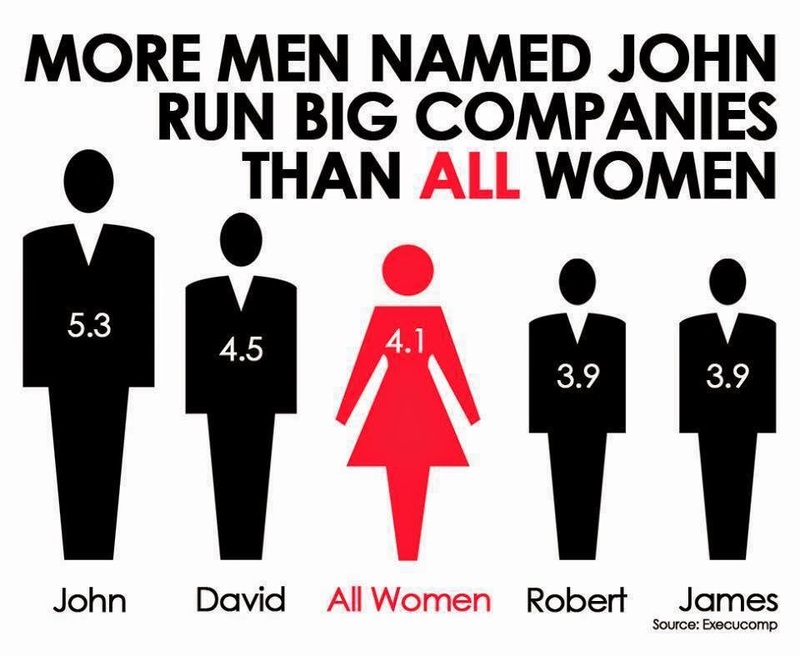 Not that there is anything wrong with being called John (obviously) but this blatant sexism and inequality is a nonsense. It is also simply bad for business if you exclude half the world from the the potential pool of talent to recruit from. The picture above is from America. In the UK there are 17 of the top 100 FTSE Chief Executives called John and only 7 women bosses. 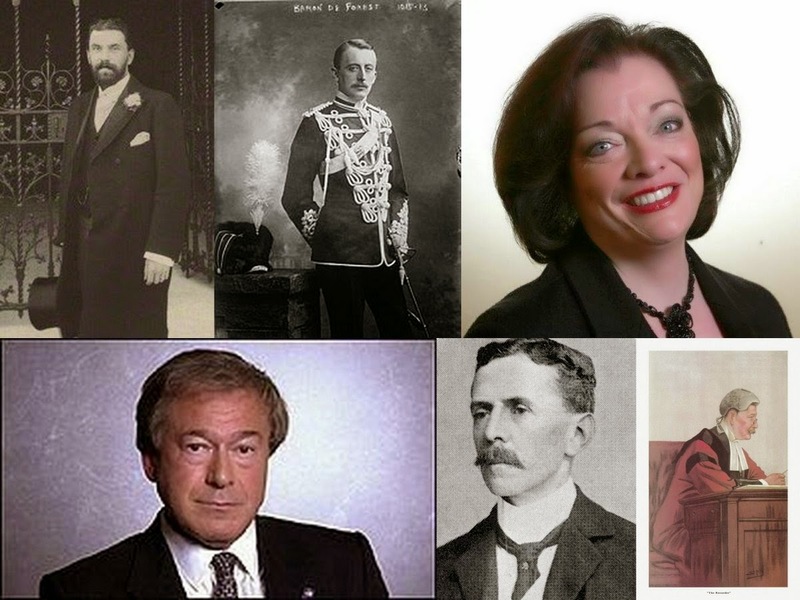 Hat tip to excellent local history website "E7 Now & Then" for a fascinating and topical post on the MPs who have served the Forest Gate part of West Ham North. Amazing that we once had an Austro-Hungarian Baron as our MP, another who was responsible for getting the elderly a state pension and one who called his local Labour Party (that had deselected him) "100 per cent Trotskyist, Militancy Tendency, Communist and IRA supporters". "Inside Housing" on Friday had another gloomy article on the problems facing the Social Housing Pension Scheme (SHPS). "John Gray, Unison’s National Executive Council member for housing associations, thinks there is a danger that employers overplay the impact of the deficit. He says: ‘If employers have got genuine reasons, we are more than prepared to sit with them and listen. However, if this is just cost-cutting there is going to be a row – and that could mean industrial action. People will go out on strike to protect their pensions. Mr Gray says the deficit is ‘not a real number’, as it is calculated based on historic low gilts which, he says, are likely to normalise eventually, making the scheme’s investments more capable of meeting its liabilities. ‘The message should be “don’t panic”. The numbers may be scary, but this is not real money,’ he says". I am a trustee on a private defined benefit pension scheme which has performed pretty well over the years with regards to investment but still has a growing "deficit". I asked our investment advisor recently what would our "deficit" be if government gilts prices were at their historic norm. He said it would be largely wiped out. I notice that some defined benefit pension schemes are already returning to surplus and advisors are busy trying to get the companies hands on the money.Which reminds me of the 1980s when most schemes had massive surpluses. It is about time that the industry and the regulator realise that we way we measure pension deficits is broken. We need to change the yardstick. Pension actuaries and accountants need to learn how to count. 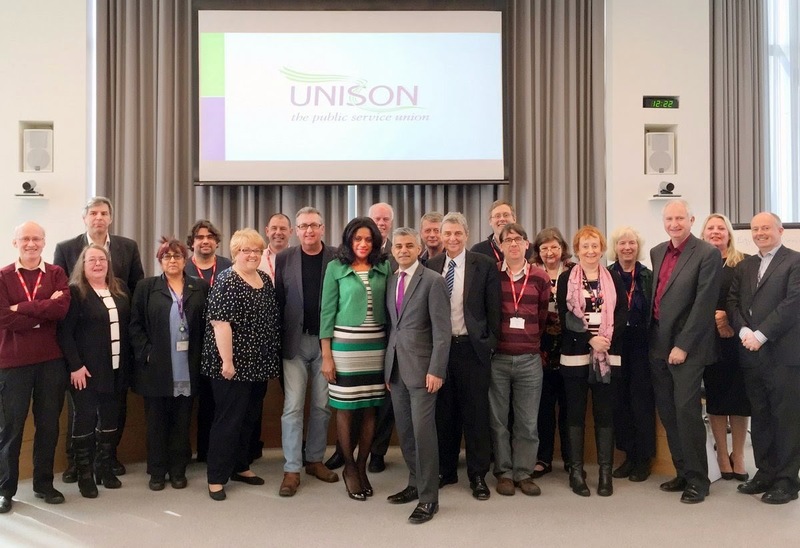 This picture is from last weeks meeting of UNISON National Labour Link Committee next to guest speaker, Sadiq Khan MP, Chair Eleanor Smith and General Secretary Dave Prentis. Assistant General Secretary, Liz Snape, gave us a briefing on the UNISON General Election Strategy. There was some fascinating information. Research shows that UNISON members are more likely to vote than average; at least half of our members are planning to vote Labour and that our GS, Dave Prentis, and local UNISON stewards, are far more trusted as a source of political information than politicians and the media. Sadiq Khan MP gave a positive and uplifting speech about how elections will be determined by people talking amongst themselves. The role of the wider Labour movement will be vital to get the message out that people should not be just commentators but participants in the election. Ed Miliband is an exciting leader and while Labour is not totally Utopian the choice on May 7 is not Utopia but between Ed as Prime Minister or Cameron. 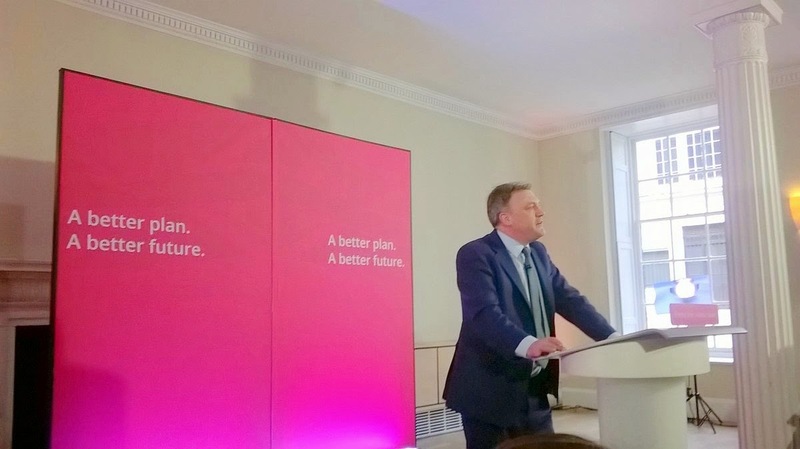 Last week I watched Ed Balls give a typically combative speech at the RSA about Tory spending and taxation plans if they won the next election. On Sunday morning I again saw Ed interviewed on the BBC Andrew Marr programme who then went on to interview Tory Chancellor, George Osborne. Ed's message on both occasions was not just an anti-Tory rant. I thought that he made an convincing case that in this election there was a clear economic ideological battle going on between Labour and the Conservatives. Labour are planning to eliminate the deficit by making cuts but also by increasing wages and making sure that the rich pay their fair share in taxes. The Tories are not only planning to make massive cuts to public spending to clear the deficit, they have announced plans to go even further and reduce government spending to the same share of national wealth as in the 1930s (35% of GDP). When interviewed by Andrew Marr, Osborne did not deny these plans. The Tories are cutting not because they need to but because they want to. This is an resumption of an age old fundamental ideological battle between the left and the right in British Politics. Ed argues persuasively that the only way that a future Tory Government would be able to reduce public spending to the level of the 1930s, is not only to further slash and burn public services but they will have to something even more damaging, such as introducing charges for the NHS. No other country only spends 35% of GDP on public services without charging for health services. On this point Labour financial plans are more credible than the Tories. There is clear red water between Labour and the Tories. A battle of ideas between those of us who believe in fairness and equality and that the role of the state is to enable such change and those who think the state has little or no such role and that such things are better left to the "market". So the choice is clear. People must decide what sort of society they want to live in and they must vote or note vote accordingly and then live with the consequences. seeking funding for its Newham LGBT Youth support group via a crowd funding campaign. They aim to raise £6,000 and have already donations from local football team Clapton Ultras after their Football vs Homophobia’ match. The crowd funding will last until the 11th April. See its press release. "Paris: The only support for Newham’s LGBT young people. East London based charity Aston-Mansfield is launching a Crowdfunder campaign on 14th March to ensure the survival of ‘Paris’, its LGBTQ youth group which offers peer support and mentoring to vulnerable young people. It is the only group of its kind in Newham. The campaign, which hopes to raise £6,000, will secure the future of this essential project helps young people as young as 13 to overcome harmful behaviour and make better decisions. Through our support, we equip them to be proud of who they are. Many have come from situations where they are isolated and confused, failing or not attending school, and engaging in a variety of damaging behaviours. 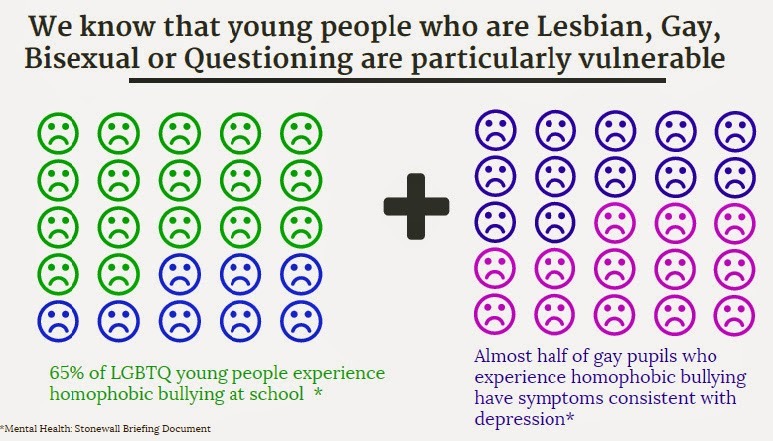 Evidence from Stonewall suggests that 55% of LGBTQ young people experience homophobic bullying at school and 49% of gay pupils who do experience homophobic bullying have symptoms consistent with depression. There is a higher prevalence among LGBTQ young people of depression, damaging behaviours, and most worryingly of all of suicide, with NCSS estimating that 1 in 4 will attempt to take their own life. Over the last 2.5 years, ‘Paris’ (named by the attendees themselves) has worked with 35 LGBTQ young people, 14 of whom now attend our regular weekly session. Please help us keep supporting Newham’s LGBT community and donate here: www.crowdfunder.co.uk/parisyouth"
On Tuesday evening (and repeated 5pm today) the excellent investigative Radio 4 programme "File on 4" examined whether at the same time that Councils are suffering from massive Government cuts - their pension funds are also being ripped off by fund managers in excessive fees and charges. There was an interesting consensus of views that they are indeed being ripped off. On the one hand former policy adviser to David Cameron, Michael Johnson, argued that 101 fragmented and inefficient Council funds running the same pension scheme was a "national embarrassment". While from the opposite political corner, UNISON national Officer, Colin Meech, compared the scheme to a bucket full of leaks and holes which constantly needs topping up. The programme needs to be congratulated for pointing out that contrary to the tabloid stereotype the majority of people in the Council pension scheme, are not the so-called "Town Hall fat cats", but low paid, part-time women. Also unless the scheme becomes more efficient in the future then these low paid workers will pay the price with reduced pension benefits or higher contributions. My fellow UNISON pension representative, Malcolm Cantello, described how the charging structure is so complex that no-one seems to know how much his pension fund actually pays out. Birmingham Councillor, John Clancy, believes that merged regional "super funds" would not only cut costs but enable them to have the scale to invest in much needed infrastructure projects. The researcher, Dr Chris Seir, thinks that the actual cost of the Council pension scheme could be more than double, as previously thought, at around £1 billion per year. Imagine what better use hard pressed Councils could do with that sort of money? Probably the most controversial statement made (out of many) was a remark by Michael Johnson that suggested the reason why the current government had kicked the question of cutting costs and merging Council pension funds into the long grass was because the fund management industry funds the Conservative Party. I suspect that Michael is now completely off his former boss' Christmas card list. After our street stall today in Stratford many West Ham Labour Party members went off to canvass in the marginal seat of Ilford North to support Wes Streeting as its future Labour MP. We were split between two large local canvass teams. It was a little cold but mostly sunshine and blue skies. In our team we had a little bit of light hearted banter with some builders refurbishing a house about who they should vote for in the General Election. One of them claimed he was "posh" so he had to vote Tory. I said since they were hard working Labourers they had to vote for the Party called "Labour" Not sure they were totally convinced. I knocked on one door and an elderly lady answered and explained that she was looking after her grandchildren while her daughter and her husband was out. I asked whether she knew if they voted Labour, she looked at me with surprise and said of course they would be voting Labour for the sake of their children. I had to tell her that I couldn't agree more. 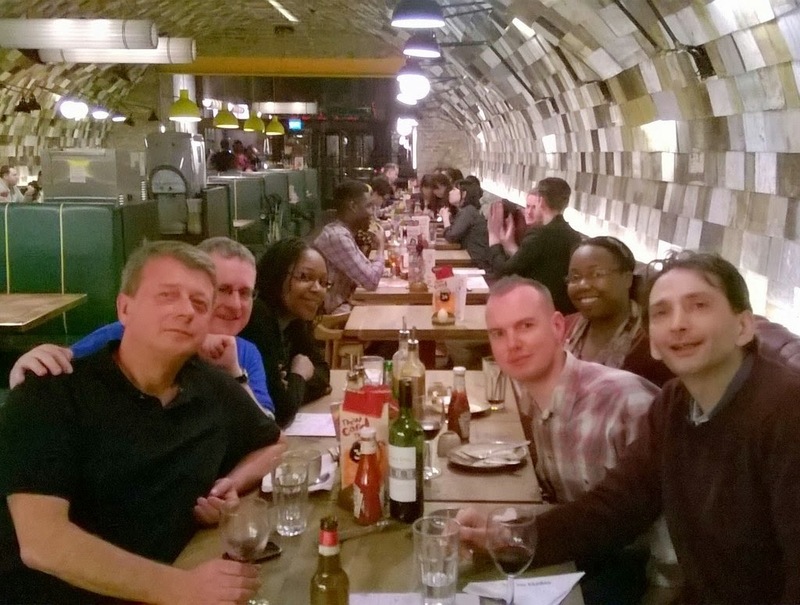 Afterwards we had a political debrief in the "New Fairlop Oak" in Barkingside (also known as "well deserved drink and bite to eat"). As always considering we were campaigning in a ward with 3 Tory councillors, the response was very good. I have also never seen any opposition canvassers in this ward in the 7 months we have been helping out. West Ham Executive Committee approved this week a comprehensive campaigning plan inside and out of the Constituency leading up to the General Election on May 7th. We are all going to be busy, busy, busy. Today we had a West Ham Labour Party stall outside Stratford Shopping centre, giving out the ever popular Labour Party balloons to prospective voters under the age of 10 and leaflets to their parents on Labour plans for rent controls and protect the NHS. We had a very positive response with people coming up asking for Labour Party posters to put up on their windows, telling us that we must get rid of the Tories and how they will always vote Labour. There was some good conversations with residents and shoppers on key political issues and we picked up case work for local Councillors and MP's. After we finished the stall many of us went off to "door knock" at the marginal seat of Ilford North for Wes Streeting. I have been a member of the Co-operative Party (which shares values and advances the co-operative agenda by standing joint Parliamentary candidates with the Labour Party) for a number of years but have been a member of the Co-operative Group for even longer. 2 or 3 times a week I shop at my local Co-op and I have a savings account with the Co-op Bank. 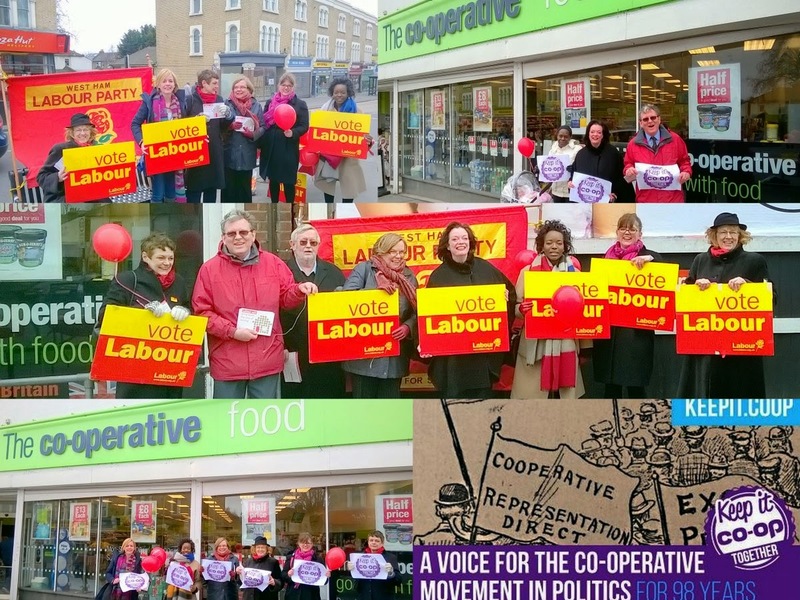 The Co-operative movement has gone through a pretty awful time in recent years largely due to debt and the governance failures of the Co-op Bank following the Financial Crisis. But there is still a massive consumer retail co-operative movement in this country with 8 million members and 100,000 employees.I think it has potentially a bright future. The arguments in favour of Co-operatives remain the same as do their values and principles. "Co-operative businesses are owned and run by and for their members, whether they are customers, employees or residents. As well as giving members an equal say and share of the profits, co-operatives act together to build a better world". Co-ops are not perfect but how better is it to shop at your local co-op, rather than with other supermarkets who may pay their staff poverty wages on insecure employment contracts; cream off the profits, who don't care about the environment or are tax cheats. Following the problems and uncertainty of recent years it is natural that the Co-op Group stops and thinks about its future. But it is vital that the Co-op continues to have a political voice and retains its link to the Co-operative Party. 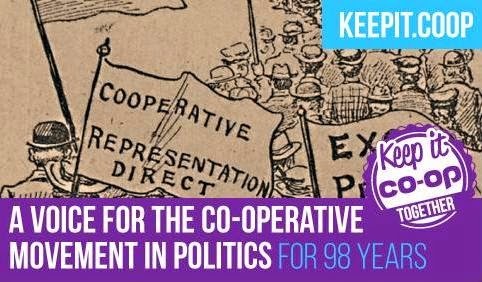 In the same way as trade unions created the Labour Party in order to have a political voice, the Co-op needed to have their voice and that is why they created the Co-operative Party. At the forth coming 2015 Annual General Meeting of the Co-operative Group there may be a motion to end the link with the Co-operative Party, which would mean the end of its political voice and its representation in Parliament. Ending the 98 year political voice of the Group would be a further blow to the movement at a time of rebirth after crisis. If there is no strong voice for co-operative values in politics and society then then we risk becoming further marginalised and then irrelevant. I hope at the AGM members will vote to "Keep it Co-op" and save our political voice. AMNT co-chair Janice Turner talks about her "Red Lines" idea to the audience. Pension funds are blamed for being partly responsible for the crash of 2008. As asset owners they were "asleep at the wheel" and did not take their responsibility seriously and allowed the banks and financial institutions to nearly destroy our economy and seriously damage our investments. What "Red Lines" hopes to do is to allow all pension funds regardless of size assert their rights of ownership on the assets they own and are responsible for. Small pension funds do not have a voice even though they are estimated to own £300 billion of assets. Large pension funds can afford to engage with their fund managers and the companies they own but they always lose important votes at company AGMs since most fund managers interests are not aligned with asset owner interests. In a telling phrase from AMNT activist Bill Trythall (on left of photo) there are "Armies without generals and generals without armies". Janice compared the current arrangements with the electoral system in the 18th Century when only the rich and powerful had a vote. What "Red Lines" is about is small and large pension funds, as well as a wide range of other charitable and ethical funds, agreeing a common set of Environment, Social and Governance (ESG) beliefs and instructing their fund managers to vote in a certain way or explain why not. The devil will be in the detail of course but it should not be beyond the wit of man or woman to agree a common set of voting instructions to fund managers on issues based, for example, on the UK Stewardship Code or the United Nations Compact on Human Rights. If companies do not comply with "Red Lines" instructions without good reason then fund managers should vote against the Board at AGMs and if fund managers do not comply without good reason, then they should run the risk of being sacked by trustees. After speeches there were various workshops on how to formulate and enable "Red Lines". It is at an early stage and is going to be a time consuming and difficult process to bring about but potentially "Red Lines" will indeed revolutionise governance practices and bring about more responsible ownership and accountability. 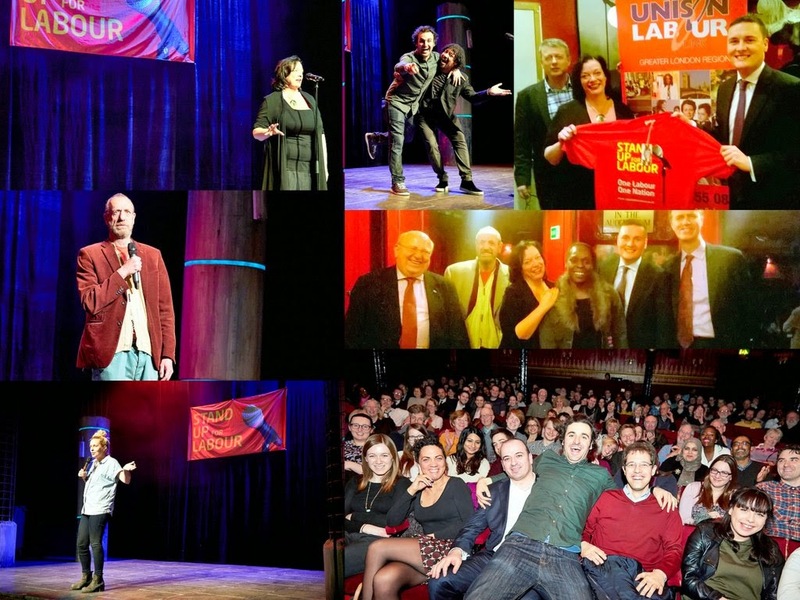 Hat tip to West Ham Labour blog for most of the above pictures from last nights hugely successful "Stand Up For Labour" comedy fund raiser. The event was sponsored by Greater London UNISON Link and raised money for the Ilford North and West Ham General Election campaigns. West Ham MP, Lyn Brown, started the evening by welcoming everyone to the packed theatre. Brilliant acts, Arthur Smith, Sara Pascoe and Patrick Monahan were compered by Paul Rickets. At the finish, Ilford North Labour candidate, Wes Streeting, gave a passionate speech about the absolute importance of getting rid of the Tories on May 7th. Many thanks to the organisers in West Ham Labour Party and "Stand Up for Labour" for all their work. The staff at the Theatre Royal were as usual, absolutely fantastic - polite, helpful and totally professional. I understand that this was one of the biggest ever "Stand Up For Labour" events and let us see if we can make this an annual show in West Ham. You don't have to be a raving leftie to think this is completely wrong and bonkers. 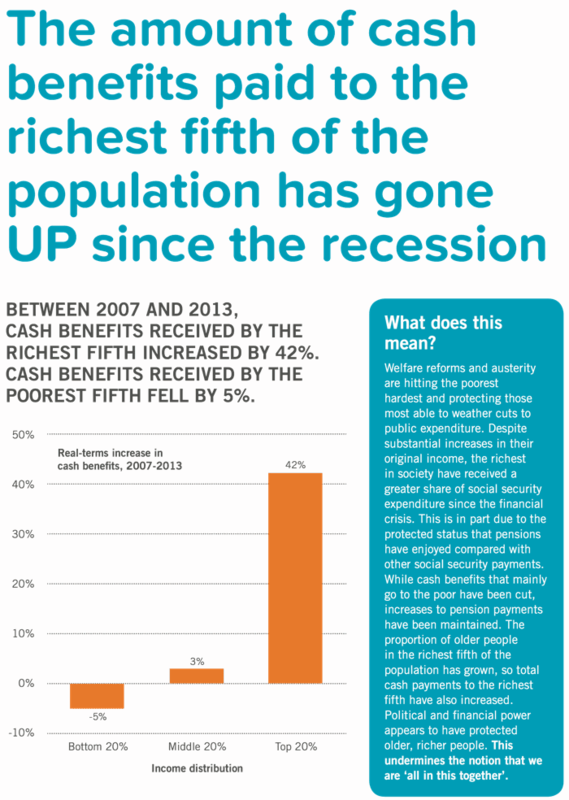 Inequality Briefing have found that the "Between 2007 and 2013, cash benefits paid to the richest fifth of the population increased by 42%. For the poorest fifth, benefits fell by 5%"
Tory Welfare reform has meant that the poorest have had their income reduced while the richest have seen their benefits increased. 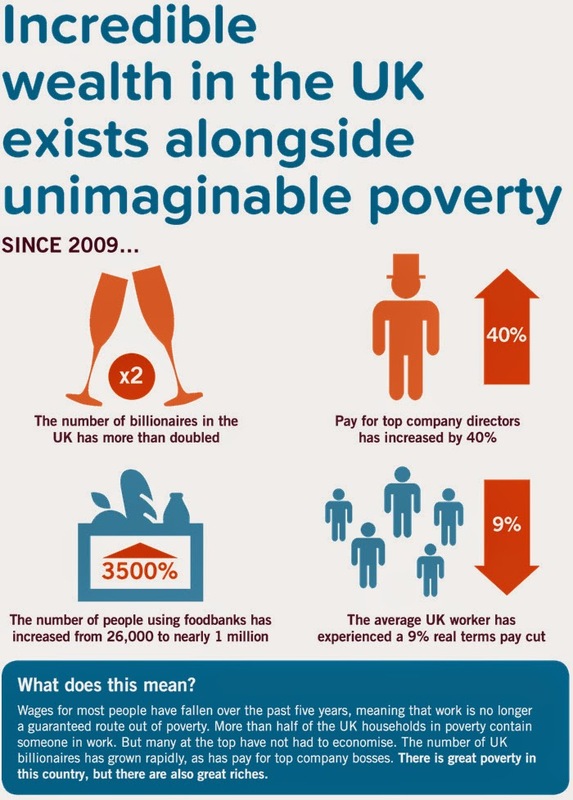 This is mostly due to increases in the state pension to very rich (top richest 20%) pensioners. This morning I received written confirmation that I have been accepted as an eligible candidate for the UNISON 2015 National Executive Council elections. I have been nominated by 40 UNISON branches for the Community Service Group General Seat. Many thanks to all branches who have nominated me and I will be emailing them tomorrow to thank them. I am standing with June Poole from Rochdale branch. June is a highly respected and long standing low paid UNISON activist. She works for a small voluntary organisation while I work for a large Housing Association. I think we will make a great team representing all UNISON Community members. The postal ballot starts in April and I will be posting more information nearer the date. Update: Lisa Nandy MP, Shadow Labour Minister for Civil Society has also agreed to speak to the meeting. Thursday 5 February I attended Rebecca Cheetham Nursery School Governors meeting, then part of the West Ham ward meeting and finally my ward AGM at Forest Gate North. Saturday 7 February I went away with our local Army Reservists, 7 Rifles, for a familiarisation day on Salisbury plains. Accompanied by Cllr Whitworth and other Cllrs. We watched local troops on ranges, cooked an outdoor meal and observed the Rifles practicing fire and manoeuvre infantry tactics. It was very cold but very interesting day. Tuesday 10 February I attended an evening executive meeting of the London Labour Housing Group at the House of Commons. We discussed a possible housing manifesto for future Labour candidate for Mayor of London. Wednesday 11 February I attended Newham Council Pension Committee, where I submitted some guidance I had received from the LGA about pensions for Councillors being in their view unlawful and also asked questions about the proposed Newham Pension Board. I have since submitted a report on the proposed Board. The Pension committee clashed with the Regeneration and Scrutiny Commission meeting so I was not able to attend both. There has been no meeting of the Housing Residents Scrutiny Commission due to a shortage of Scrutiny officers. Friday 13 February I went on site visit to Ladywell Street, E15 and met local residents and West Ham Police sector team regarding ASB, dumped rubbish and environment. I have requested a site visit with representatives from landlord Family Mosaic. 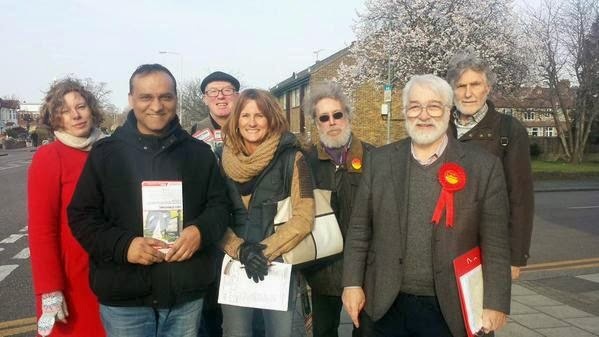 Saturday 14 February I held my surgery at Vicarage Lane Community Centre then in the afternoon went canvassing for Labour in our target seat Ilford North with other West Ham CLP activists. I was away on annual leave from 19 February to 22 February. Monday 16 February was Newham Council Labour Group meeting at East Ham Town Hall. Monday 23 February was Full Council meeting during which I asked the Executive advisor for Finance questions on our borrowing strategy and the legality of the consultation process of the Newham Pension Board. 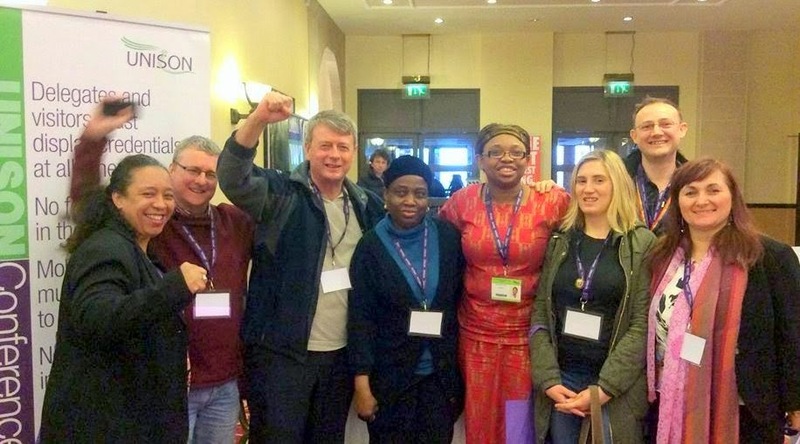 I was away at my UNISON Community Conference in Bradford 26 February to 1 March 2015 as one of its two National Executive Committee members. "the only choice for our members will be between a uber right wing Tory or a Labour Government..."
This is from my Labour Link Officer submission to the UNISON Housing Association Branch Annual Report 2014. "On May 7 2015 the only choice for our members will be between a uber right wing Tory Government or a Labour Government. If a Tory government is returned then I believe we will see the Housing Associations becoming “for profit” organisations and an accelerated race to the gutter of low wages, insecure contracts and limited or even nonexistent employment law rights for all. Housing management and repairs could be outsourced to private companies in the same way as cleaning and care workers have been. Voting Labour will also protect the NHS by repealing the Coalition Health & Social Care Act and the Bedroom Tax. Labour will tax bankers, build more homes and regulate private sector housing. UNISON and the Labour Party are all part of the same wider Labour Movement family. Like all large families I have ever come across we do not always see eye to eye on all things. However, I have always believed in the old saying that, “the worst day in any Labour government is much better than the best day in any Tory Government”. Progressives should consider joining the Labour Party to help Ed Miliband continue to rebalance the Party towards the centre left. Branch Labour Link members will play their part in the forthcoming election by taking part in campaigning, door knocking and delivering leaflets for Labour Candidates. 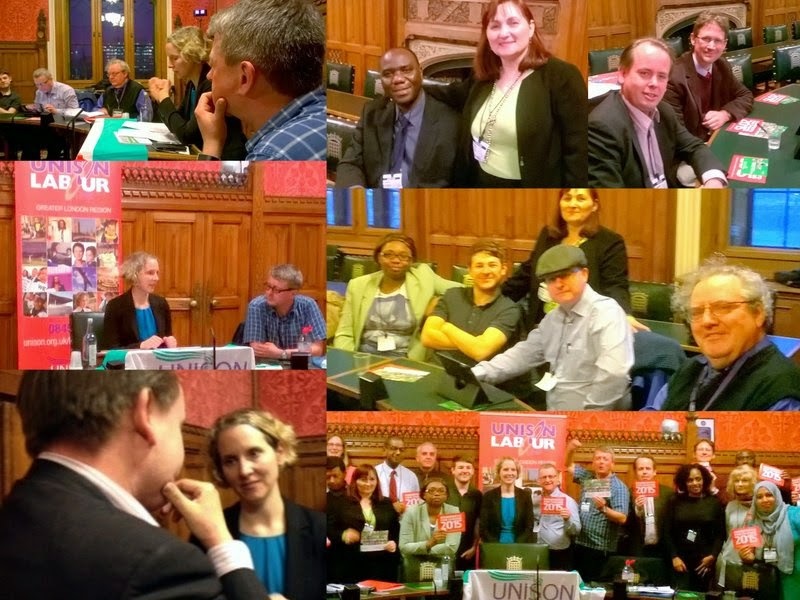 We will also be organising a branch mobilisation event at the House of Commons on “Rights at Work” which all Link members will be welcome. Don’t forget either that as Labour Link members that you can play a part in the selection of the Labour Mayoral candidate for London. 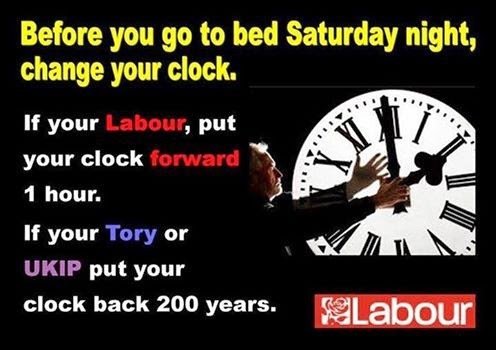 So watch this space and make sure you and your family are registered to vote - and then vote Labour on May 7th. John Gray Branch Labour Link Officer"
Unions21 Conference. It is a shame but I have a clash so I don't think I will be able to make it this year. I was interviewed by "Inside Housing" magazine for an interesting piece published last Friday titled "What's in a name?" A small Housing Association in High Wycombe, called "Red Kite" had asked its staff to write its own job descriptions and create their own job titles. The belief behind this is that social housing organisations tend to be "stuffy" and "hierarchical" and need to empower their staff to improve services. A view to be honest that I have more than a little sympathy with. However, in the article I admitted to being a bit of a "sourpuss" about this idea. While workers need to be at the centre of any consultation about job design or job descriptions, it is actually a complex and difficult subject. As a trade union steward "I have seen real problems where there have been poorly defined job descriptions,’ he adds. ‘People are paid very different amounts of money for doing very similar jobs". This is a huge issue if you believe in gender equality at work. It can be prescriptive and a little bureaucratic but the hard truth of the matter is that unless you have an equality proofed job evaluation system, based on job descriptions you will see women (and other discriminated minorities) being paid less for equal work. As sure as eggs is eggs. There has been a move recently away from such assessments towards "spot salaries" or so called "market rates". While market rates have been used as a defence against equal pay claims, it is not by any means a complete defence. "Market rates" can be inherently unfair (and therefore potentially unlawful) since they just reinforce any existing gender discrimination in the market. 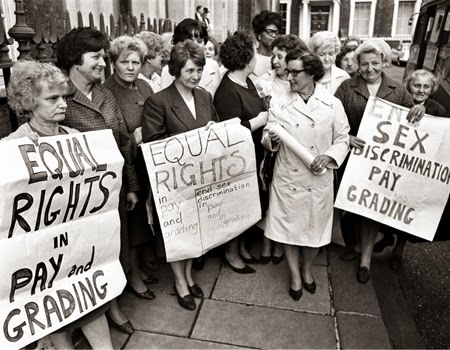 Equal pay claims have cost employers in the public sector hundreds of millions of pounds in recent years. When it first started no-one expected this. The private and "not for profit" sector had better watch out since it is clear from the press (Supermarket giant ASDA has 1500 claims against it) that the "no win, no fee" lawyers are going after them. So evaluate or discriminate. If you do discriminate then be prepared to pay the price in reputational and financial terms. Job descriptions really do matter. 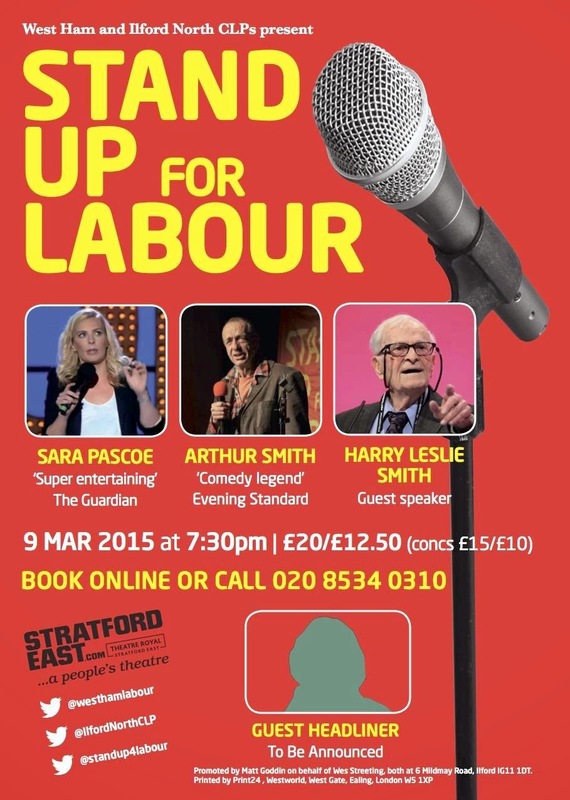 Only one week to go before the West Ham and Ilford North CLP "Stand Up For Labour" comedy event taking place at the Theatre Royal, Stratford East on Monday 9 March. Most tickets have now gone so click here to reserve your place on line before it is too late. "...thieves and con merchants to steal and feast upon our members pensions..."
This was my speech to the UNISON Community Conference yesterday on Pensions. The Composite motion had been moved by Community member June Poole from Rochdale Local Government Branch on behalf of National Women's Committee. It was very positive to see the motion being seconded by a delegate from Ymlaen/Forward – Unison Cymru, who reminded us to make sure we get representation for our sector on the new Local Government Pension Boards. "Conference, John Gray, NEC member for Community, speaking on behalf of the Service Group Executive, in favour of Composite A. Conference, let us never forget that Pensions are a fundamental trade union issue. In fact one of the founder unions that went to form UNISON was set up specifically to argue for pensions for its members. As a housing officer in the east end of London, I see first hand the miserable and degrading poverty that so many of our elders live in. Too frightened to put the heating on in winter, surviving on cheap out of date foodstuffs, too poor to buy their grandchildren treats. In many ways, the current situation facing workers is now even worse. Millions of workers in our sector have no access to any employer pension, since they work part time or are paid too little. Millions more are being cheated by their employer with tiny and inadequate contributions. While complete untruths are said about the sustainability of defined benefit schemes such as the Social Housing Pension Scheme (SHPS). To top it all Conference, this Tory led government, will from April 6, allow thieves and con merchants to steal and feast upon our members pensions, in what I have no doubt will be the greatest ever miss-selling scandal. There is no getting away from this. The employer has to pay enough money into a pension scheme to allow its workers to retire in dignity. The State must also play its part by providing funding for our services which will ensure there is enough money to pay for pensions. But don't forget that the top 15 housing association made over £1 billion surplus last year, yet many pay rubbish pension contributions to their workers. Equally employers who have left or are threatening to leave our existing defined benefit schemes, know it is a simple lie, that you will get rid of any so called "deficit" if they leave. In fact it can make it worse. While those of us still in the Local Government Pension Scheme, see the financial service industry continue to rip us off on charges and an often rotten and undemocratic governance structure. Conference. We can make a change. In Australia where many pension funds are run by trade unions, they have used their organising and political power to make it the law that all employers have to contribute 12% of pay into a workers pension. We have to organise and campaign for decent pensions with our own employers and we have to ensure that we use our political influence and clout, not only to get more money to fund decent pensions in our sector, but to win the wider political argument. That we want to live in a more equal and just society, that simply will not tolerate poverty for the old or any body else for that matter and will do whatever is necessary to bring about change. Conference, Go back to your branches and organise, campaign and fight for your pension futures, Conference, Please support this motion. Thank you. Conference in Bradford. See previous posts on the Seminar which took place immediately before here and here. The Conference was chaired by UNISON Vice President Wendy Nichols. Community is the Service Group for UNISON members who work for Housing Associations and Voluntary organisations. We are the third biggest Service Group in the union and have over 60,000 members and I was there as one of the two National Executive Committee members for Community. After the usual introductions, standing orders report and appointment of tellers the Annual Report was accepted and the debates on motions began. There were 10 different motions which were debated. All were supported by the Service Group Executive (SGE) and all motions were agreed by Conference and are now our policy. Including my branch motion on Union busting. I spoke on the Pensions Composite (which was an agreed merger of two motions) on behalf of the Service Group Executive. There was some incredibly powerful speeches made with delegates explaining their struggle to provide quality services while on the minimum wage or zero hour contracts. One speaker explained how she had to depend on food banks to survive. It was also pointed out that there was only 3 young members present (including Rachel from our branch) which is not good and needs to be addressed. There was quite a controversial point put forward by one delegate during the debate on welfare reform that anyone who does not think that there is any difference between Labour and the Tories are "fools and liars". 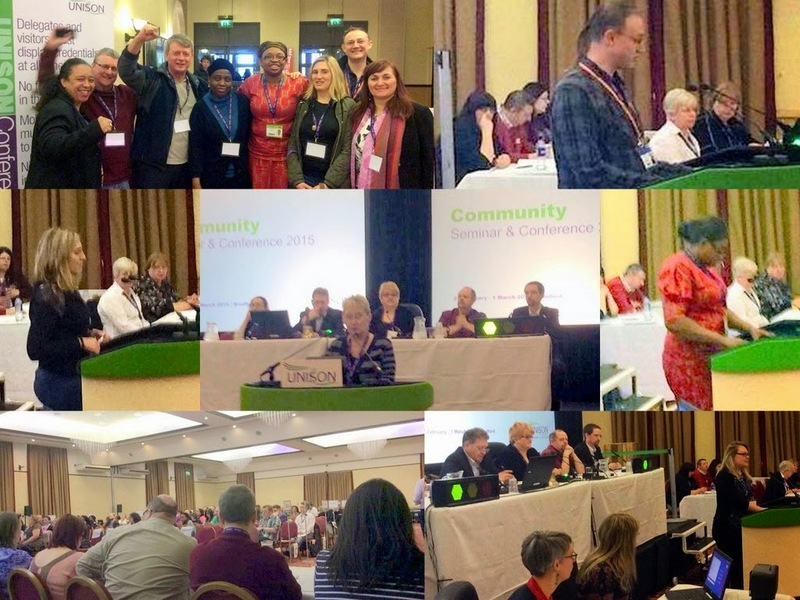 This is now I believe our 5th Community Conference and I think we are far more confident and certain of our identity as a separate, independent and growing Service Group within UNISON. We were pretty united as a Conference and aware of what we are up against and what we have to do to defend and represent our members. Key to this is trade union recognition, organising, recruiting more members and activists while ensuring that we have effective structures and local support.